Daqo Chisay can be a tricky Shrine in Zelda Breath of the Wild. If you haven’t previously seen the mechanics used in here, you’ll be amazed once more. It revolves around one treasure chest and how it can be used. In this guide, we’re going to show you how to beat The Whole Picture challenge and complete Zelda BoTW Daqo Chisay shrine. In case you’re having trouble finding any of the 120 shrines in the game, we have a detailed Zelda BoTW shrines guide, with all the locations on a convenient map. From Central Hyrule, following the road southwest, you’ll eventually end up in Gerudo Desert. The road here takes you straight into Gerudo City. The Daqo Chisay shrine entrance is just next to this city. 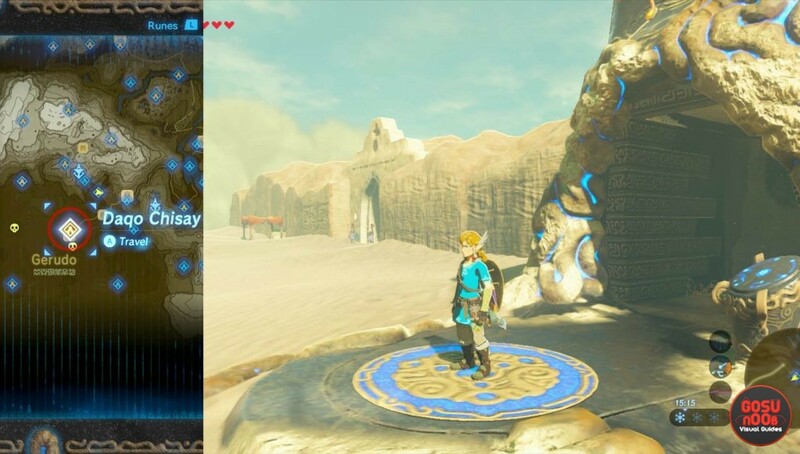 If it’s your first time here, you might think that, after completing the Shrine, you’ll find an entrance to Gerudo City, but this is not the case. In order to get into Gerudo Town you’ll have to acquire a special outfit, found just northwest from the city. In order to complete “The Whole Picture” challenge, you’ll need to use everything you find inside the shrine to power up the Spirit Orb gate and open it. We’ll need to open the first gate using the barrel and the metal cube. Using Magnesis, place these two items so they connect a power line up to the gate further left from the shrine’s entrance. This tiny room hides a second barrel. With two barrels and one metal cube, we can now power the closest room. Connect the power lines for this specific room using these three items to reveal its content. Inside, you’ll find a treasure chest with a Thunderblade (22 damage). Now, this is where the confusing part begins. The next step requires us to power up and open the larger gate to the right of the shrine’s entrance. This can’t be done with only two barrels and one metal cube. We need to use the treasure chest as well. That is, if you don’t have any metal shield. Third room, second metal cube. Place the two barrels, one treasure chest and metal cube in order to power and open the gate. The metal cube will need to stay between two platforms. The gate on this side unlocks access to the second metal cube. Now, just take these two cubes and place them in the corner next to the stairs that lead to the Spirit orb. Use the two metal cubes to open the gate to the Spirit Orb.